OKI has reinforced its range of A3 multifunctions with the release of two new models, the MC853 and the MC873. 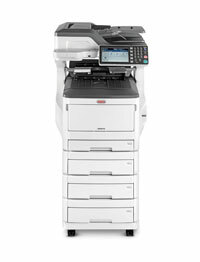 Running respectively at 23 and 35 ppm onto A4, these MFPs are unique in that they offer fax as standard. These machines are the next evolutionary step from the MC851+ and MC861+. They have the same print engine, but a new automatic document feeder and the 7-inch touch-screen interface which we have already seen on OKI's latest A4 MFPs such as the MB492. The MC853 and MC873 support Google Cloud Print to help printing from Android mobile devices as well as Chromebooks - or any computer using the Google browser. They also support AirPrint, Apple's wireless printing protocol. They also have OKI's latest software platform, the smart Extendable Platform (sXP), so they can run document capture or cost control software Solutions. Finally, let's remember these two machines come with a three-year warranty and have the particuliarity that they may be purchased without a maintenance contract, a rather rare feature on the A3 toner multifunction market. So a customer with very small volumes and/or very low coverage rates could find an extra appeal in buying this equipment.